Work on aerial structure near Aviation Blvd. and 111th street. Concrete curing for the tunnel walkways on the northern section of the project under Crenshaw Boulevard. Pouring of concrete for the bridge over the 405. Deck construction begins to take form on the bridge over La Brea Avenue. Installation of flooring rebar for underground segment near 60th Street. Grinding of welded rail for placement near Century Blvd. and Aviation Blvd. Installation of rebar at the location of the future Hyde Park station. Rail assembly near Century and Aviation. Rail placement continues along the alignment. Rail welding taking place on at-grade section adjacent to Florence Avenue. Reinforcement installations for the foundation of elevators at Century and Aviation boulevards. Surface finishing of the bridge structure over La Brea Avenue. Concrete placement for the multi-purpose emergency walkway on aerial structure near the junction with the Green Line. Above are some photos taken over the last several weeks of work on the Crenshaw/LAX Line, the 8.5-mile light rail line with eight new stations that will run between the Expo Line and the Green Line. Metro is planning to open the project in the fall of 2019. 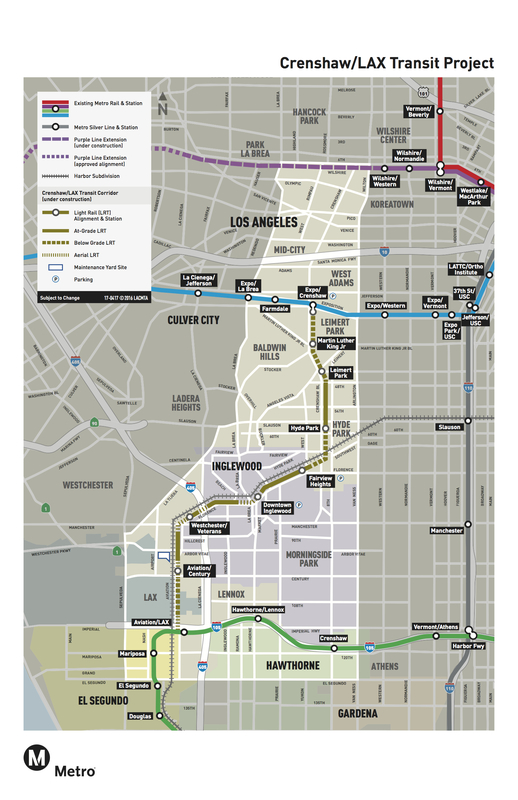 The $2.058-billion project is funded mostly by Measure R, the half-cent sales tax increase approved by L.A. County voters in 2008. Hey Steve, can you explain the odd, double height nature of the bridge over the 405? Will one direction of travel run on top of the other, as opposed to side by side? Or is it like a path for emergency access? It is my understanding that the exisitng rail bridge is being used as a support for the falsework of the new bridge. Eventually, after construction, the old bridge will be demolished and the new bridge will be the only one left. Steve, If I have this wrong, let me know. Looks like three (3) levels! IIRC the contractor is using the old Santa Fe bridge to support the forms for the new bridge. I don’t remember if the old bridge will be removed after completion …………. Steve? I’ve asked the project team to answer your question — I’m not sure off the top of my head. I did find this rendering in the environmental study for the project: http://media.metro.net/projects_studies/crenshaw/images/FEIS_FEIR/2.0_Alternatives_Considered.pdf on page 2-26. Looks like regular rail bridge, albeit new one. I’ll leave follow-up comment after I hear back from team. As for the 405 bridge, the old bridge will remain after the new one is completed. It is being considered for use as part of Inglewood’s active transportation plan but nothing has been decided as for its use.